We were delighted to have Social Development Minister, Mervyn Storey MLA Storey visit our new housing scheme at Laurelvale, Crumlin. Consisting of 3 and 4 bedroom houses, 12 of the 14 properties have been handed over to tenants. The properties have been acquired by Habinteg with support from the Department for Social Development. 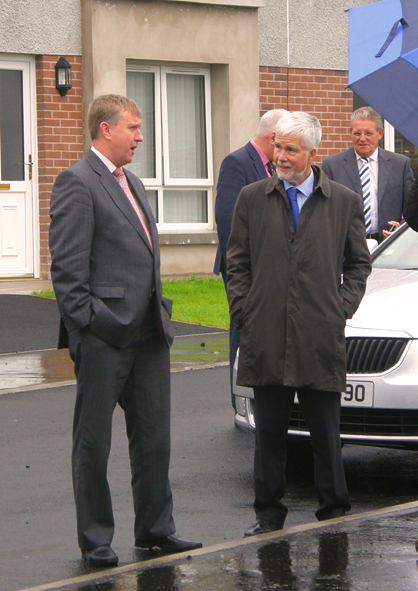 Minister Storey said: “I am delighted to welcome the new tenants into these high quality homes. This latest development is a tremendous and much needed addition to the village. During a tour of the Crumlin development, the Minister met with a new resident and was shown around one of the new homes.